Polish rabbi; died in Cracow about 1730; grandson of R. Joshua, author of "Maginne Shelomoh." He officiated as rabbi at Shidlow, Poland, being at the same time a representative of Cracow in the Council of Four Lands. After 1715 he became rabbi and president of the yeshibah at Cracow, where he remained till his death. 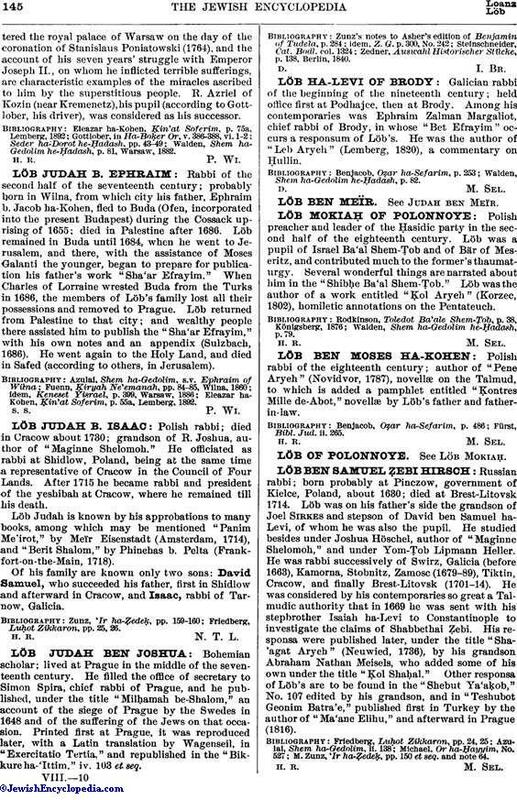 Löb Judah is known by his approbations to many books, among which may be mentioned "Panim Me'irot," by Meïr Eisenstadt (Amsterdam, 1714), and "Berit Shalom," by Phinehas b. Pelta (Frank-fort-on-the-Main, 1718). Of his family are known only two sons: David Samuel, who succeeded his father, first in Shidlow and afterward in Cracow, and Isaac, rabbi of Tarnow, Galicia. Friedberg, Luḥot Zikkaron, pp. 25, 26.